One of common misconceptions about the Wiccan priesthood is that we are here to "serve" the Pagan Community as a whole. Whilst this may be the view within the modern practices of Paganism, within more traditional practices, it is not necessarily accurate. 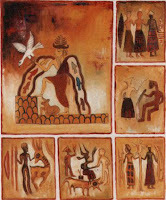 We may take it upon ourselves to provide services to the community as a whole (ie, the Temple of the Dark Moon provides free Full Moon Gatherings throughout the Winter months as well as organising social events such as family orientated picnics to coincide with the Equinoxes), our underlying role however is to be of service to the Gods. In order to be of service to the Gods, one needs to first believe that they actually exist - that they are not merely a Jungian archetype, a figurement of one's imagination. The next step is to establish a relationship between yourself and them. This can be achieve through the performance of daily devotions (the reciting of hymns or prayers, the burning of specific incense and candles, leaving offerings, etc), meditation, and most importantly, research (specificaly important if you are interested to devote to a particular Deity). If you feel that you are not drawn to a specific Deity or panthology, then you may like to start with the "classics" (Roman or Greek), read some myths there ... then maybe move onto Egyptian, Celtic, Norse or even Native American. Books containing mythologies of these cutltures are more readily available online and from libraries than other pantheons. Another suggestion is to look into your own heritage/bloodline. Is there anything of interest there? Alternatively, you might like to tackle something completely out of the ordinary to see what is there. It is not all that uncommon to find yourself drawn to a particular Deity or pantheon either, regardless of what your initial choice may be. 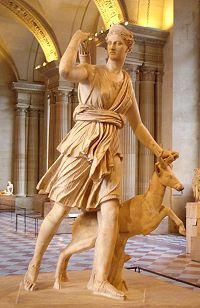 When I first started working with Deity, it was the Greek Maiden Artemis who I was drawn to, however, behind my distractions, As't, the Egyptian Isis, was waiting patiently for me to realise her call. Whilst As't still remains my primarily Deity, I have been drawn to work with others over the years - some fleetingly, as if they come through insisting on a ritual for some specific purpose (or even use me as a catalyst to stir the interest within another person), other Deities I tend to work with on a more regular basis, even if it is once a year as with the annual Yemaya Blessing of the Waters ritual we perform in January, or the Hekate Supper in August. The same goes for my interest and study of mythology and ancient cultures. Originally, my interest was (and to some extent, still is) that of the Celts. When my connection with As't became more established, so did my interest in Egyptology. In recent weeks, however, I have noticed another shift occuring as I have started to become increasingly interested in the ancient civilisations of Assyria, Babylonia and Sumeria. This interest has gone beyond my interest and connection with Ereshkigal (who will be one of the five Goddesses I will be talking about in the upcoming "Encountering the Dark Goddess" workshop. And whilst I am yet to determine which Deity from these pantheons is calling to me, learning about these interlacing cultures is proving to be a fascinating journey as I learn about how these ancient people honour and devoted themselves to their Deity.